Dugan Montjoy misses going horse-logging. There’s a lot to miss. 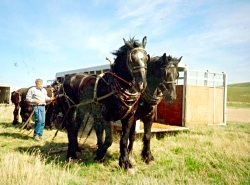 Dugan began horse-logging during school breaks and summer holidays fifteen years ago. He’s been working at it steady for twelve years, mostly with Palatine Horse-Logging, the company started by Dugan’s father Don, in Lillooet. All that changed. In 1996 world prices for wood dropped. Mechanized logging drove the price of wood down and it was hard for horse-loggers to compete. The soft-wood lumber dispute made it difficult for companies to calculate their costs. Then came the mountain pine beetle. At first Forestry worked with horse-loggers to take out only the damaged trees. That didn’t last long. Now it’s all clear-cutting. “Just whack everything down.” Dugan says. It’s cheaper and faster to clear-cut. Horse-logging has been going downhill for the past five years. There’s just not enough work for everybody. The Montjoys talked it over and decided that Don would continue Palatine Horse-Logging while Dugan looked for other work. Don’s been horse-logging for twenty-five years, and he’s attached to it. “It takes a while to figure out what makes you happy.”, he comments. “Those big draft horses give a calm sense of serenity. The outside of a horse is good for the inside of a man.” Palatine Logging contracts for Lytton Lumber and picks up little bits of work here and there, enough to keep Don and his team going. Don’s one of two active horse-loggers left in B.C. Dugan stuck it out as long as he possibly could. Eventually he turned to clear-cut falling, first in the B.C. Interior, then on the Queen Charlotte Islands. “Something to keep me afloat.” Clear-cut logging, he says, is the very opposite of horse-logging. 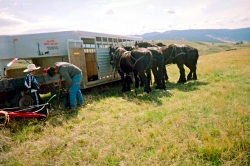 “Horses, being smaller and lighter, cause less damage to the land, they use narrow roads, and leave a forest in place. With clear-cut logging everything, including little trees, is just cut down and crunched into the ground by machines.” Dugan said he isn’t seeing any selection cutting any more. 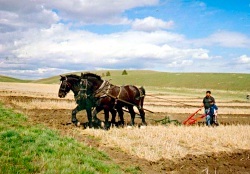 A good horse-logger has to be a bit of a teamster and a bit of a logger, know his way around both horses and the bush. It’s a partner-ship between a man and his horses. Historically, wherever there was logging in Canada, there were horses. “When something like that dies, who’s going to pick it up and do the training?” Dugan asks sadly. He’s been teaching Tristan, his ten year old son, to work with the horses, but what are the chances of his making a living that way? “Nobody will know how to do it.” Dugan says. A traditional skill will be gone. Dugan misses working with the horses, but he’s not giving up. “If I can just find another horse job, I’ll go back horse-logging. You never know what the future will bring.” Like most horse people, Dugan’s an optimist at heart.